It was necessary for the battle area to be carefully selected and had to be suitable for tank movement which required hard ground that had not been too disturbed by previous actions. Also the chosen area needed to be undulating to afford adequate cover. These requirements quickly pointed to the Cambrai sector. The advantage of Cambrai was considerable. Two canals that were nearly parallel and separated by a distance of 7 to 10 kilometres would cover the side of the tanks and infantry advance. At a final stage the Canal de L’Escaut which runs through Cambrai had to be crossed, but it was not considered as impossible. 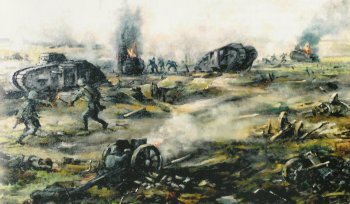 In the Cambrai sector the Hindenburg line was known to be particularly strong which was the main reason for its occupation by second line Divisions and a reduced number of men. However the strength of the defence line was a positive point for the effect of surprise, as no attack was seriously expected by the German forces. The excellent communication and railway network to organise the logistic support and the preparation needed for such a scale of battle was considered perfect. The sector was in hands of the Third Army under Sir Julian Byng with its 3rd Corps on the right and 4th on the left. No infantry reinforcement was made at this first stage. However the whole Cavalry Corps (5 Divisions), more than 1,000 artillery guns of all calibre, nearly 300 planes and 476 tanks were made ready to be launched into the battle. On the German side, just three Divisions of the XIIIth Corps of the 2nd Army under General von der Marwitz were engaged to control the line. 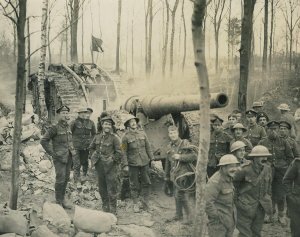 On the first day of the Battle, 20th November at 6.20 am., the British artillery, which had been silent during the entire preparation, suddenly opened fire in a massive onslaught of shells and smoke. Tanks began to advance in long waves, followed closely by the Infantry, crushing the belt of barbed wire then crossing the wide German trenches. The surprise was total. Many gaps were made in the Hindenburg system. Nine thousand German prisoners were taken. At midday some of the tanks had reached their final objective. The Infantry successfully consolidated the position and waited for the Cavalry who received their orders too late to advance, except at Masnières where the Germans had mined a bridge which rendered the crossing of the Canal impossible for the tanks. All attempts by the Cavalry and Infantry on that sector were tragically decimated. To the south of Flesquières, long columns of black smoke rising from the destroyed and burning tanks clearly indicated that something was wrong. Due to a fierce resistance by the German field artillery, the tanks were stopped. The 51st Highland Division, too far away to help, was not able to prevent the disaster. In spite of these localised problems, the overall result was good and gave better hope for the British Commanders. The Hindenburg Line had been broken at last. The advance was approximately 7 kilometres deep behind the German line and 12 kilometres wide. On the morning of the 21st, Flesquieres was recaptured by the Scottish Highlanders who were determined that nothing would stop their advance. This was followed by Cantaing and then Fontaine-Notre-Dame. However among the attacking Divisions, men start to suffer from exhaustion and progress was limited. The position of the British line was so close to the expected conclusion that it almost became an obsession to reach it. Even more effort was asked of the men in localised attacks on an enemy which was rapidly becoming more numerous and powerful. A final attack by the Guards Division and the 62nd West Riding Division was then launched on the sector of Fontaine-Notre-Dame and Bourlon, but brought no result in spite of fierce fighting, The Battle Headquarters became convinced that it was time to abandon all hope of further immediate progress in the Cambrai area and everything was organised to prepare for consolidation and winter. After the first day of surprise, the Germans had no doubt of the British intention and quickly reorganised. Special equipment was sent to stop the tanks and their troops were ordered to contain any British attack. During that long resistance, enormous reinforcements were massed on each side of the British salient. On 30th of November, with no preliminary artillery barrage, the enemy adopted their new tactic of attacking with elite regiments known as the ‘Stormtruppen’. In many places, the British positions were too weak to resist such surprise attacks and were often overwhelmed. Many prisoners were taken and the Germans recaptured a good part of their lost ground but their advance then ran out of power. The amazing resistance of the 62nd Division on the western side, and those of the 29th and Guards Divisions on the east, assisted by tanks and Cavalry, brought the Germans to a stop, and in some places even forced them to withdraw. The result of the battle was virtually a status quo, but with very heavy casualties on both sides. The British had 44,000 casualties including more than 20,000 wounded and 7,048 missing. They lost to the enemy, 9,000 prisoners, 165 guns, 600 machine guns and more than 90 tanks. The Germans had 41,000 casualties including 11,000 prisoners. 145 guns and 456 machine guns fell into British hands. The 1917 Battle of Cambrai changed the whole face of warfare for ever and restored the hopes of the Allies. The long held stalemate war had ended.